This year, 3 million people will join their family, friends and colleagues in nearly 700 communities across the nation. Our volunteers and staff will encourage and support you in your efforts to raise awareness and funds. No matter if this is your first year or your 25th, you can expect the event to be fun, compelling and rewarding. 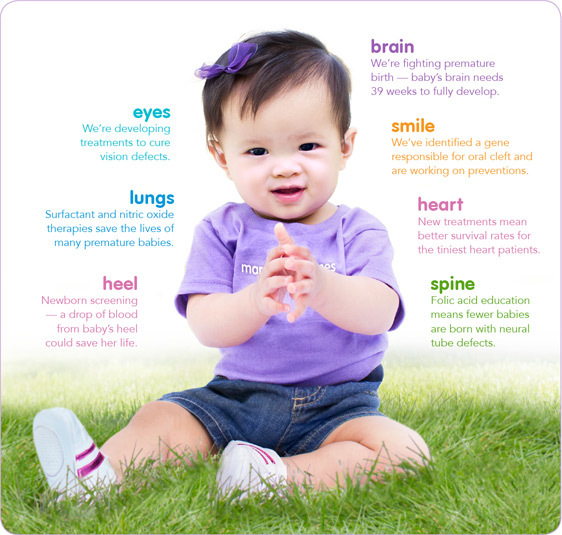 The money you raise in March for Babies funds important research and programs that help babies begin healthy lives. More than 500 local programs were supported to help educate women and reduce risks during pregnancy. Comfort and information was offered to 90,000 families with a newborn in intensive care through March of Dimes NICU Family Support®. Your involvement also helped the U.S. premature birth rate to drop for the 7th year in a row.